I’m not quite sure if Zeek Earl, Chris Caldwell & Brice Budke shot Prospect on Kimika Ying’s Sister Planet or not, but they’re both beautiful yet not quite hospitable worlds. I thought Prospect might be a nice short film to inspire our Avatar Hangout tomorrow morning. Oh, and the film was funded by 338 backers on Kickstarter – awesomesauce! Hangout on Venus this Saturday! 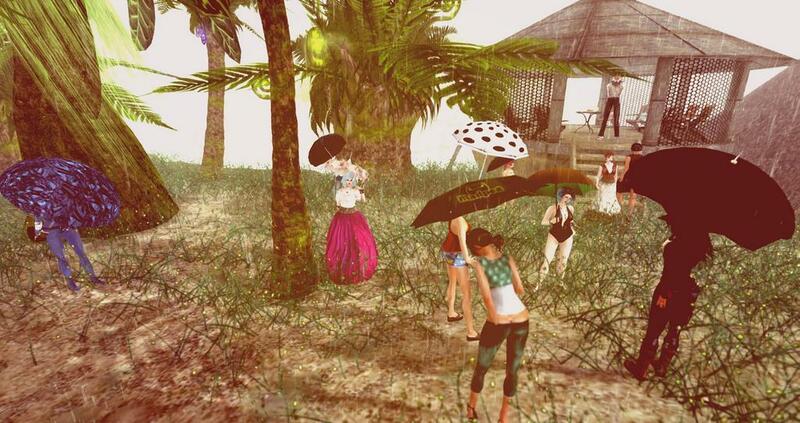 Avatar Hangout at Kimika Ying’s Sister Planet this Saturday, 9a California / 5p London. A dance place without the dancing. But you can dance if you want to. A philosophy discussion group without the philosophy. But you can talk philosophy if you want to. Vanessa- if i dont make it its not that i didnt want to i had to bring son to hospital rl for eye problem…i would love to come at another one though! OMG Scar! So sorry to hear. 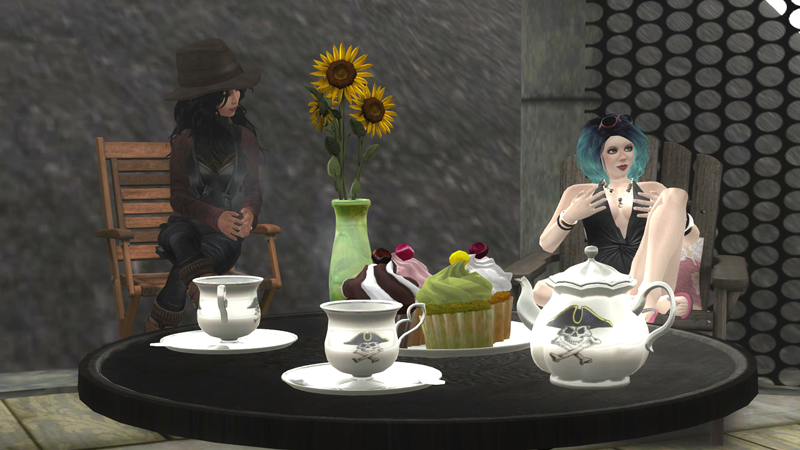 Hope everything works out ok. Avatar Hangouts are the 2nd Saturday of every month, so there’s always another one. Buy your son some ice cream for me. The ultimate chemical skin peel! Taking a refreshing acid rain bath in one of the waterfalls on Kimika Ying’s Sister Planet at LEA29. 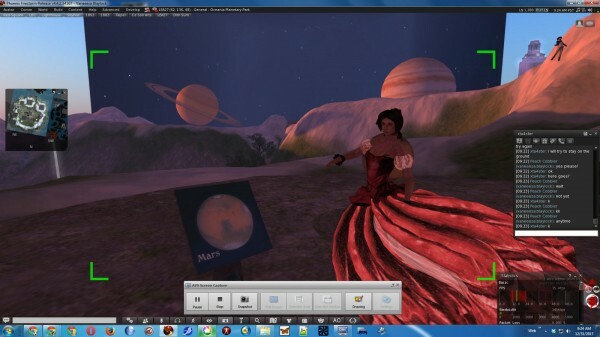 Kimika Ying (of Oceania Planetary Park where Virtual Ysidora danced last year) is working on a new installation, Sister Planet. It’s Venus. But not 2014 Venus. More like 1950 Venus with carnivorous plants and other mid-century fantasies. Ying’s also interested in taking the 19th century Steampunk sensibility and moving it forward to the 20th. Kind of like 1880 Steampunk & 2014 Planetary Science meeting in an alternative middle of the 20th century. Anyway, Emma Pleyel-Maybe and I were hanging out there this week. We’re sitting on the rim of a surprisingly genteel, if active, volcano. Adventures on the world of Venus as it might have been. She’s actually just received her 5-month land grant and only started work here, but it’s a pretty compelling environment already. With the Site Dance course coming around again, I’m sure I’d like to do some work here! That was so much fun, Vanessa! It’s been great working with you and learning something totally new at the same time. As I mentioned during our chat, I’ve gotten a lot of inspiration for the monologues that I’m creating from working on this project with you. Thank you, thank you. Xta! I just learned that Oceania Planetary Park CLOSES on 1 January 2014! I’m fine either way on this, so if you want to get something done there in a week, we can, or if it’s too much rush we can skip it. With either choice on the physical site… I know you’ve written / recorded some voice on that. We can still do something with that. Where is that BTW? I saw/heard it from a PBR post and meant to comment on it but never had the chance. LMK what your pleasure is. Ho ho ho, Merry Christ[a]mas! Well! The nerve. I haven’t even gone in there yet. Gotta get in there. I wanna get something done in there — YES! Here’s the link to the ccmixster snippet. There’s been one remix! So cool. Hugh McElveen mentioned that he might wanna remix it, so I will reach out to him to see if he’s still interested. I’m with my family right now in CA, but I could probably get in on the 27th or the 29th or the 31st. Around 7:30 PST. Any of those dates work for you? Great Xta! All 3 can probably work, but 7:30 PST… AM or PM? On the audio: so cool that you got remixed! Perhaps you’d be up for trying another recording. Without the plosives we might inspire another remix or two. There are a few ways to cut the plosives out. Some microphones have a “low cut” switch which helps. Also, if you aim your breath to go OVER the microphone, and not AT it, that can help a lot. A tool that works great is a “pop filter” which is a hoop with fabric over it. This blocks the big air mass of your plosives, but lets the frequencies of your speech through. You can buy one at most music shops. You can also make one by stretching sheer tights (stockings, pantyhose) over an embroidery hoop and putting that between your mouth and the microphone. You can also try to control how you let your breath out generally and on consonants like “H” and “P”. Even though you’d like to eliminate plosives, you still want to be as close to the microphone as you can be. If you back off the mic, you’ll get more and more room tone (it will sound like you’re speaking in a trash can) And a more “dead” room is better. So lots of furniture, sofas, books, fabric, etc will make you sound clearer. A room with lots of hard surfaces, bare walls, etc, will make you sound worse. A clean, flat voice track is a gift to a remixer who then has the maximum creative options for their mix. Yay! All good ideas. I totally know what you mean by the plosives. It’s a miracle anything got up there at all. That was built for deadline, baby! I’m probably not going to get it rerecorded before the 1st (I can try, but I don’t have a mic out here in California, which is where I am until the 28). So how about we try to meet in SL tomorrow? Let’s shoot for 7:30 a.m. if that works for you. What a great topic to be discussing! Never having been much of an online girl, the power and opportunities available through the online medium is something I have come to realize more and more within the past couple years. In realizing this I have attempted to make more of an effort to be present online and connect via the web but I have personally found it very difficult to feel connected when only communicating online, and struggle to get myself committed to such mediums when I find myself more drawn to the physical world in front of me–and I’m of the younger generation. I would argue some of it is because, as you both spoke to, many communication sites on the internet can seem so surface level with nothing that enriching coming out of them. But as you both speak about other websites with more intellectual and substantial material I am left to think it is not that the web itself is that banal but the sites that are most known, most frequented and for this reason tend to be the sites people (including myself) gravitate towards unconsciously and easily when online–making people intern want to delete their FB as they don’t want to gravitate towards these cites. The internet has such a wide array of possibilities, and people use it for mindless past-time as well as a way to develop their ideas but it’s all a matter of choice. But perhaps one of the benefits, and also the disadvantages, is when online you have the choice of what “watering holes” you will enter. Depending on what you read and where you voice your opinions you are choosing the people you most influence and are influenced by. This can be beneficial because you can be selective to what your needs or desires are, but can’t it also be somewhat dangerous by turning a blind eye to other parts of society that you may not identify with, but are still very much present. Of course this can be done in real life as well but when facing what’s directly in front of you, you don’t have as much of a choice for what comes at you or what “sites”, opinions, or visual imagery you get. The online world seems like a good reactionary and processing place to the real world for me. But I still find it somewhat limited on what you can really learn here and think perhaps your less likely to be surprised as you would in real life experiences. I think. Like you mentioned Michael, people need to be reached off-line as well as online but I think it extends beyond the friends who find such social media websites boring. The thing that makes me, perhaps the best word here is, nervous about this online movement is the amount that it has moved people away from direct contact and interaction. Which I think takes away a lot of little things to be learned, experienced, etc. Great Rebecca! On the Physical::Virtual mix, I think that varies a lot by personal taste. I think the wide distribution of preferences on what that mix is, is great. One way that people try to do both, is with Mobile Apps and Augmented Reality. Like an AR app to hold up your phone and see Yelp ratings superimposed on all the food places down the street. That’s definitely useful, but in a way also banal for me. With something like SnapChat, it likely isn’t high-value intellectual content, but it is a personal connection. In a way the radical idea of SnapChat is that it’s a lot about being an “old fashioned” phone conversation. I think you’re right about where to go for whatever part of your time you’re going to spend gazing into a flat-screen. Be that a little or a lot of time. Facebook does serve a purpose, but I think a lot of us seem to feel the less FB the better. My real hope is that we can interact here on .Re/act, .Re/search, etc, and build a Conversational Community. I think having a self-selected group who read/react to each other in a space like this can be the best. Our feedback will sometimes be insightful, but even if it isn’t, we’re getting go know a “place” and a group of people and I hope over time that can come to be substantive.